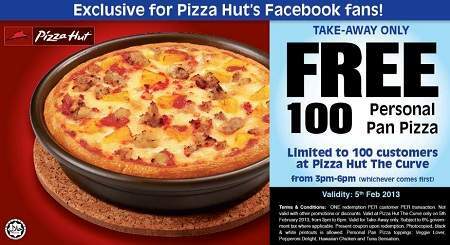 Exclusive for Pizza Hut's Facebook fans!! Get your FREE PIZZA on 5th February at Pizza Hut The Curve! YES, ABSOLUTELY FREEEEEE!! Limited to 100 customers only. Valid at Pizza Hut The Curve only on 5th February 2013, from 3pm to 6pm. SUbject to 6% government tax where applicable. Tickets for the first 100 customers will be given out from 3pm at all Pizza Hut restaurants. Available pizza toppings : Veggie Lover, Pepperoni Delight, Hawaiian Chicken & Tuna Sensation.